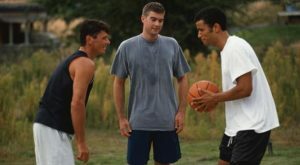 Maybe you got injured and decided to take a step back from sports for a while... or maybe you felt like you couldn’t keep up with younger guys on the court or on the field. But now, you miss the activity, the friendly competition and fun that sports can provide. Finding your way back into an athletic community may be easier than you think, as long as you can think with flexibility. Consider switching positions in multiplayer sports to lengthen your playing days. For instance, if you love baseball but don’t have the speed you used to, make the move from left field to third base. You’ll still need reflexes, but you won’t have as much field to cover going after fly balls. Similarly, if you’re into football, you might consider moving from wide receiver to free-safety. Zone defenses allow you to make a strategic move to break up the play rather than having to run a full-out route for every pass. Similar shifts can be made in individual sports as well... runners may add or subtract distance depending on their own unique strengths, swimmers may try a different stroke or distance, and both may get involved with relays. You can also think about trying another sport – which is something many athletes find refreshing when recovering from an injury or after retiring from a grueling (and often painful) career in sports. Switching to a lower-impact activity can be a rewarding way to get your sports fix without increasing your risk of injury or exhaustion. Swimming, golf, kayaking, in-line skating, skiing and surfing can all be very enjoyable sports, complete with thrill of victory or achievement, and with the added benefit of being able to enjoy it for many years to come.